Reading Time: 2 minutes VMware Horizon Client communicates with the View server, which acts as a broker between the client device and remote desktops and published applications. You enter credentials into Horizon Client, the server authenticates your credentials, and then the server finds the remote desktops and published applications that you are entitled to use. Also if you can use VMware Blast to access your virtual desktop or published applications, a client is usually preferrable to have full features. Reading Time: 5 minutes Several months ago (on 26th August) I’ve taken the VCAP5-DTA beta exam and finally I’ve got the results: it was a pass! 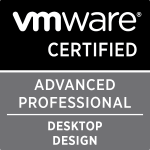 This time the confirmation email was slightly different from the usual beta result because also the score report was provided: Thank you for participating in the VMware Certified Advanced Professional – Desktop Administration program. Please find your score report attached. The result was a big surprise not because the exam was really difficult (wasn’t easy), but because was really long with several task to complete, with some of them really time consuming. Reading Time: 2 minutes The VCAP-DTD exam is quite similar, in the format, as the VCAP-DCD one, with lot of questions (115 questions! ), composed by multiple choice, drag and drop, scenario questions, along with some “visio” style design questions. The total time for this exam is 195 minutes (with the usual 30 min. extension for non native English Countries) that seems much, but could be not enough considering that some questions (scenarios based and “visio”) will take a lot of time! Reading Time: 3 minutes I’ve got the opportunity to take the VCAP5-DTD exam during the beta period (at the beginning of this year). After a really long period (common in the VMware beta exams, but this time more long that usual), on May 16 I’ve received an email with this sentence: Thank you for taking the VCAP-DTD Beta Exam. We are pleased to inform you that you passed! Congratulations! I’ve not receive yet the score report (was sent by snail mail), but does not matter too much… I’ve pass this exam, that wasn’t so easy.